my friends will tell you, i have an obsession with nail polish. my collection is slightly ridiculous but i don't care. i love each and every one of them. so since spring is officially here, i thought i'd share my favorite laquers for the season. 1. Sally Hansen, Pink Slip. A sheer, clean, pinky white. 2. Loreal, Macaroon Me Madly. A pastel peach. 3. Essie, Nice is Nice. Pastel lilac. 4. Essie, Penny Talk. Metallic rose gold. 5. Essie, Absolutely Shore. A dirty mint. 6. China Glaze, Strawberry Fields. Strawberry pink with gold shimmer. 7. Revlon, Whimsical. Milky blue with blue and pink glitter. 8. China Glaze Rose Among Thorns.. Matte, neon rose. 9. Essie, Coat Azure. Creamy ocean blue. 10. Orly, Lollipop. Pinker version of Nice is Nice. 11. Revlon, Peachy. Bold peach. 12. Sally Hansen, Kook-a-mango. Bright coral. 13. Sally Hansen, Peachy Breeze. Hot pink with zero peach. 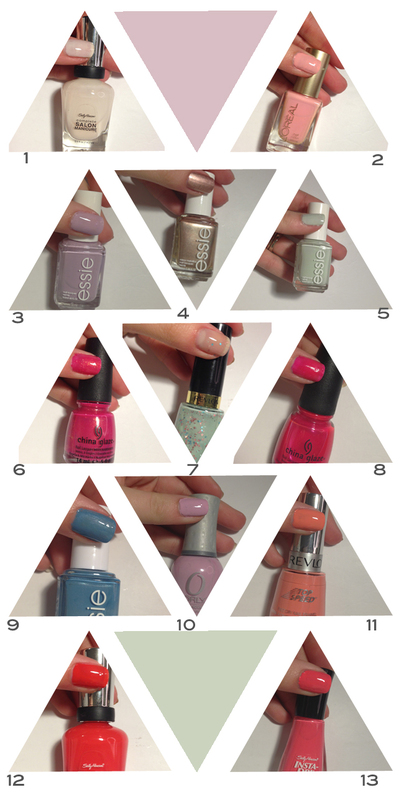 Essie is probably one of my favorite brands, along with Sally Hansen. They have a great color selection and even if the polish has a streaky consistancy on the first coat, the second coat always looks perfect. Definitely try them out! I wish we shared bathroom cabinets right now. Or dressers. Or wherever you keep those lovely little nuggets.